Description: CSX 2810 is on the point of C-712 at West Point, NY 3/2001. A late winter snowfall created this Christmas card like scene. Description: CSX B778 works across Burdick St. switching the freighthouse. Description: CSX B778 works the freighthouse in Watertown, the hoppers are carrying road salt. Description: CSX B780 heads west out of DeWitt Yard. Description: A pair of GP38-2s lead CSX Q301 through South Plainfield on an overcast day. 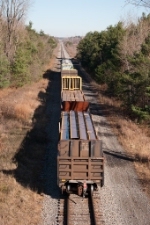 Description: A CSX local works in Woodard. Description: CSX B76928 heads north. Description: B775 approaches BROUSE with 88 cars that will be picked up by B953 the next morning. Description: A pair of GP38-2s head north out of Massena to work the Alcoa East plant on the Rooseveltown Industrial Track. Description: CSX B77817 backs towards the Freighthouse. Description: CSX B77817 heads towards the Freighthouse. Description: CSX B77817 heads south returning to Massey Yard for a lunch break. Description: CSXT 2811 brings up the rear of B77817, it will be used to lead the train back north. Description: B785 returns to Massena after performing switching duties at Alcoa East. Description: Passing Trent tower heading back to Woodbourne Yard. Description: After spending most of the day at Ricky Coleman, CSX C770-01 creeps west on the TL about to enter Woodbourne Yard, with a nice ex CR EMD on the point.